Clear blue skies, dusty terrain, barren mountains, deep gorges: if that’s your idea of beauty, head to Spiti Valley! The rugged landscapes of Spiti Valley are undoubtedly amongst the best in the world and some even say that the valley gives tough competition to Ladakh in terms of sheer beauty and wilderness. Mountain bikers and motor cyclists swear by the beauty of the barren terrain of the Spiti-Kinnaur road which is operational throughout the year except during heavy snowfall or if there are landslides during monsoons. The view of the Spiti river flowing below in a serpentine fashion is absolutely breath taking and the way the landscapes change from lush green to barren brown to white snowcapped peaks as you travel towards Spiti makes one marvel at the wonder of nature. 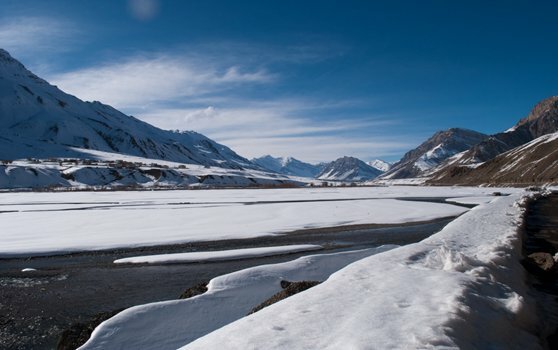 The best time to visit Spiti Valley is obviously during summers when the snow melts and exposes the raw beauty of the place. Spiti is a research and cultural center for the Buddhist monks so you can find a lot of monasteries on the way, the most prominent ones being Tabo and Sherkhang. Don’t forget to click pictures at the highest post office in the world at Hikkim and do plan a visit to Chandrataal Lake to experience serenity at its best. Chinese food is readily available here due to the close proximity of the place to China and you can also gorge on delicacies like momos and thupka. There are restaurants serving typical Tibetan cuisine too, in case you want to try something more interesting! General weather of this destination is Cold. This destination is of type Mountain.